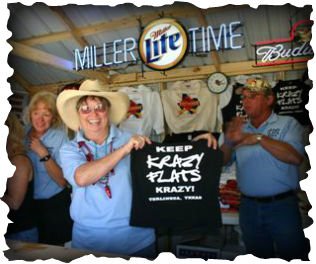 In 2005, CASI built the Krazy Flats Saloon, right in the middle of the TICC spectator camping area, as a second concession area and gathering place to stay cool and enjoy your favorite beverage. 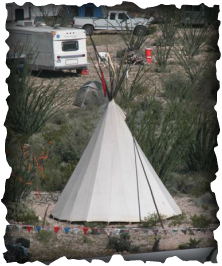 In 2012, with the financial donation from Bruce Foods, the Si Brown/Original Louisiana Hot Sauce Pavilion was added as home to many activities in the Krazy Flats area of Ranch CASI de los Chisos. Krazy Flats is both a place and a state of mind. Pictures can capture the place and its environment, but they cannot capture the state of mind. Come Join the FUN and get KRAZY !!!! 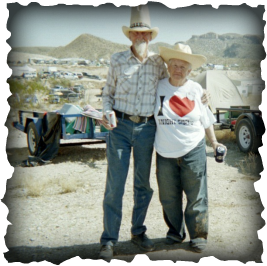 There is no age limit on having fun and Krazy Flats is the fun place, either at the Krazy Flats Saloon or at Wally's Pole and Grill.